Arms transfers; Law and legislation. Amazon.com description: Product Description: Export control laws and regulations are the legal framework for countries around the globe to ensure world peace and stability and their importance in international trade is growing. The reasons behind this growth lie in the evolution of technology, the fact that increasing amounts of goods/services are subject to controls (such goods/services representing a very large segment of world trade), and the increasing threat linked to terrorism. Consequently, export control laws and regulations have become extremely important for those involved in the international trade of goods/services with a direct or even indirect military use. Export control laws and regulations are complex, difficult to understand, and constantly evolving. Infringements can lead to very serious sanctions (civil, administrative, or criminal), and, not to be minimized, the risk of serious damage to the corporate image of one or more parties to a questionable transaction. Yann Aubin and Arnault Idiart are involved in such issues on a day-to-day basis in their respective capacities as lawyer and export compliance officer within the European Aeronautics Defence and Space Company (EADS). 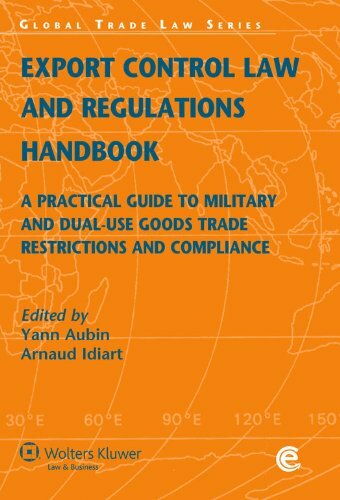 They have gathered contributions from expert practitioners (EADS and Thales as well as Hogan and Hartson LLP) and university scholars (Paris 11 Law School/Institute of Space and Telecommunications Law (IDEST) faculty and advanced students) to make the Export Control Handbook as useful as possible. The Export Control Handbook provides a practical examination of the export/import control regimes of defense and dual use goods and services of a number of selected jurisdictions around the world (China; European Union; France; Germany; India; Italy; Japan; Russian Federation; Spain; United Kingdom; United States). The Handbook contains a very useful appendix including, among other things, compliance procedures and standard country-specific application (or related) forms. The aim of each country-specific chapter of the Handbook is to provide actionable information designed to guide foreign entities wishing to undertake production in the jurisdiction (e.g., through a local subcontractor or a local subsidiary (which could be a joint venture) in order to subsequently export that product anywhere in the world. The Export Control Handbook is invaluable to any international trade professional (lawyer, compliance officer, etc.) or entity with a need to know the specific requirements to be followed in the jurisdiction in question for the efficient and legally compliant import or export of controlled military or dual-use goods or services. With Yann Aubin (other contributor) | 3 edition from Kluwer Law Intl (May 31, 2016); titled "Export Control Law and Regulations Handbook: A Practical Guide to Military and Dual-Use Goods Trade Restrictions and Compliance"
About: Global Trade Law Series Volume 33 Export Control Law and Regulations Handbook provides a practical overview of the export/import control regimes covering defence and dual-use goods and services in fourteen key jurisdictions in addition to chapters on the international regime in general. With Yann Aubin (other contributor) | 2 pck har/ edition from Kluwer Law Intl (June 30, 2011); titled "Export Control Law and Regulations Handbook: A Practical Guide to Military and Dual-Use Goods Trade Restrictions and Compliance"
About: Export control laws and regulations are the legal framework for countries around the globe to ensure world peace and stability and their importance in international trade is growing.